but with opportunities for improvement. such as labor use, in-process inventories, and flexibility. same disaster occurs halfway through the sequence. than when the S1 approach is employed. plied to automotive industry applications. Figure 1. A feasible re-sequencing. be held in buffer at the same time, which is not permitted. exceeds the buffer size of one. ess, there is some number of re-sequencing possibilities. 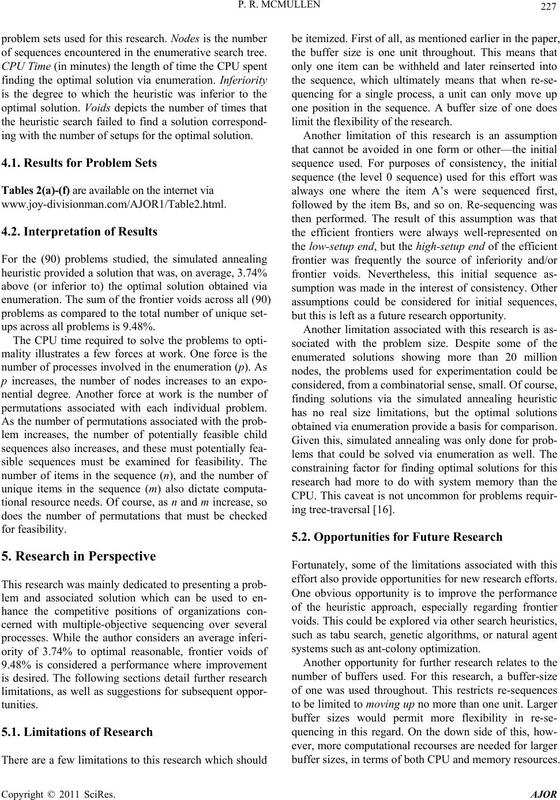 has 4P2,1,1 = twelve feasible permutations, or sequences. Figure 2. A feasible re-sequencing w ith two pushbacks. Figure 3. An infeasible re-sequencing. two processes for the initial sequence of AABC. detailed in the next section. avoid weighting schema and exploit an efficient frontier. of setups, the minimum usage rate is plotted. is the chosen ap proach to th is multiple obj ective prob lem. esses. This is true, but there are disadvantages to this. major contribution of this effort. mal solutions via complete enumeration are obtained. insertion into the sequence is consid ered negligible. 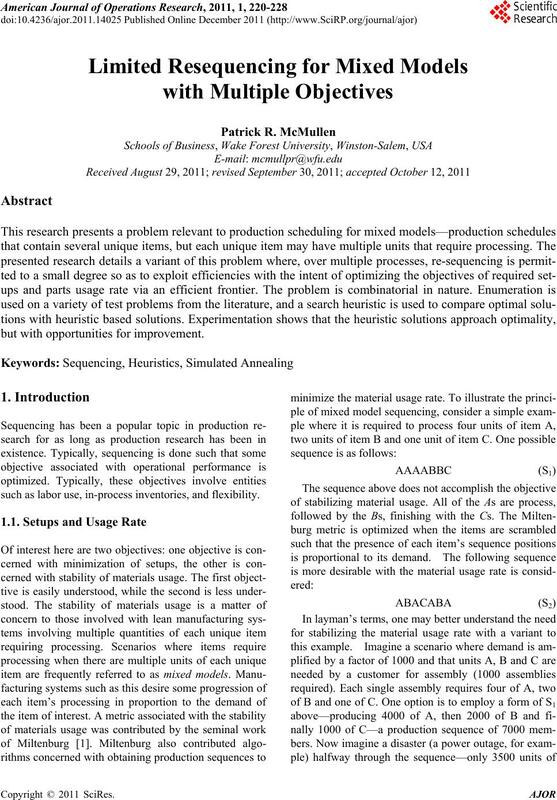 ated with the search heuristic for the problem of interest. stricting the buffer size to one. test solution replaces the best solution. This pattern continues while T exceeds TF. problem sets are listed in the Appendix. inferior to, the efficient frontier obtained via enumeration. surpass, the optimal heuristic obtained via enumeration. Figure 6. 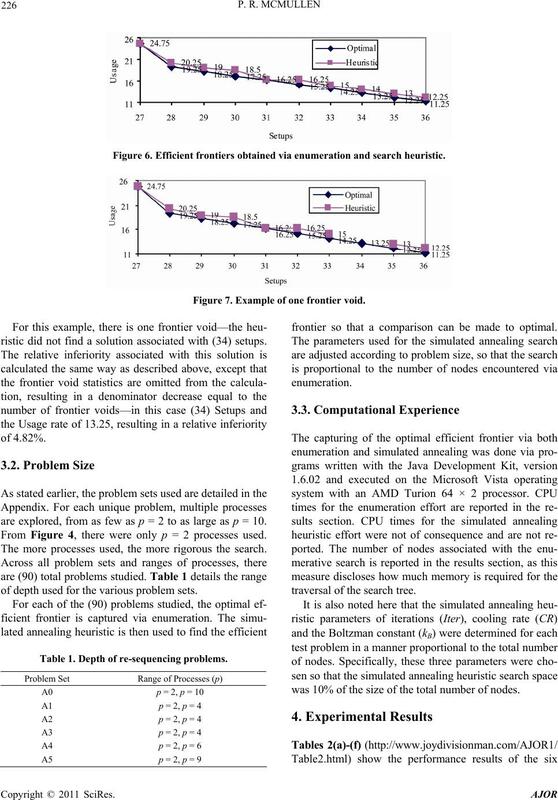 Efficient frontiers obtained via enumeration and search heuristic. Figure 7. Example of one frontier void. ristic did not find a solution associated with (34) setups. frontier so that a comparison can be made to optimal. traversal of the search tree. are explored, from as few as p = 2 to as large as p = 10. 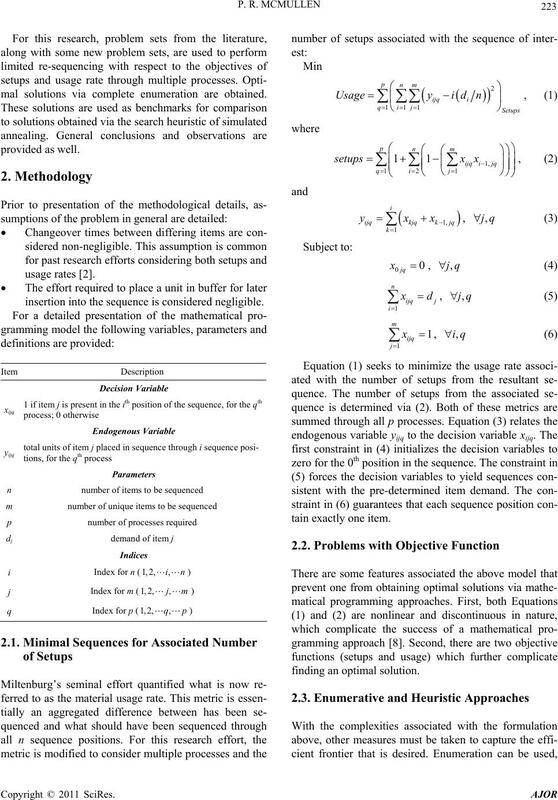 From Figure 4, there were only p = 2 processes used. The more processes used, the more rigorous the search. 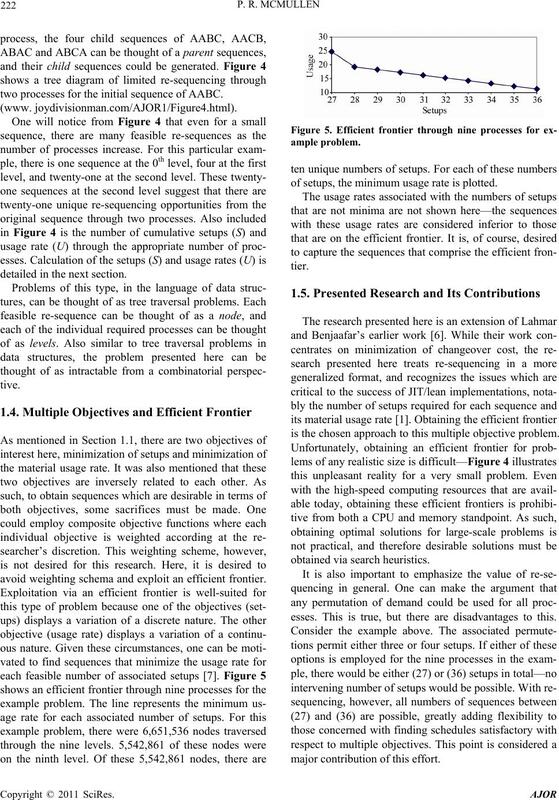 of depth used for the various problem sets. was 10% of the size of the total number of nodes. Table 1. Depth of re-sequencing problems. of sequences encountered in the enumerative search tree. ing with the number of setups for the optimal solution. ups across all problems is 9.48%. permutations associated with each individual problem. limit the flexibility of the research. but this is left as a future research opportunity. obtained via enumeration provide a basis for comparison. effort also provide opportunities for new research efforts. systems such as ant-colony optimization. buffer sizes, in terms of both CPU and memory resources. larger buffer-sizes are not unrealistic in the future. agement Science, Vol. 35, No. 2, 1989, pp. 192-207.
and Control, Vol. 9, No. 5, 1998, pp. 504-510. Vol. 32, No. 8, 2000, pp. 679-686. Vol. 55, No. 2, 2008, pp. 295-310.
search, Vol. 56, No. 2, 2008, pp. 411-424. Flexibility,” IIE Transactions, Vol. 39, No. 10, 2007, pp. duction Economics, Vol. 72, No. 1, 2001, pp. 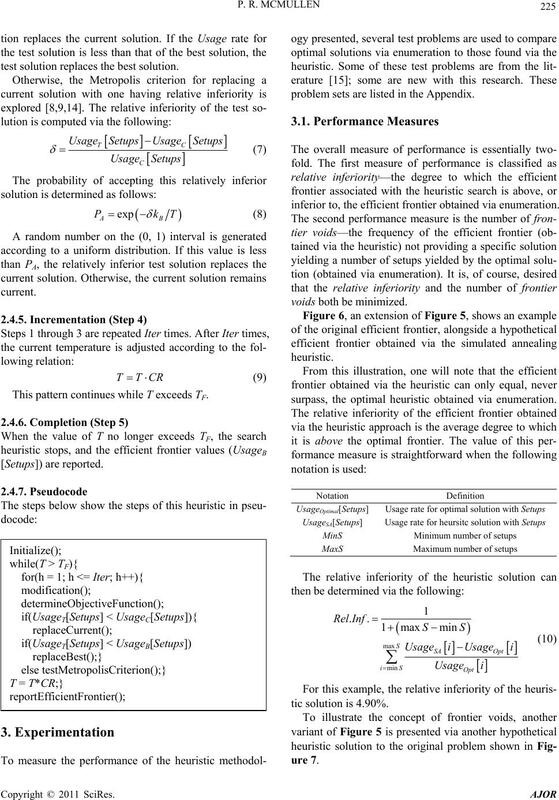 59-71.
zation by Simulated Annealing,” Science, Vol. 220, No. search, Vol. 46, No. 3, 1990, pp. 271-281.
tems,” University of Michigan Press, Ann Arbor, 1975. 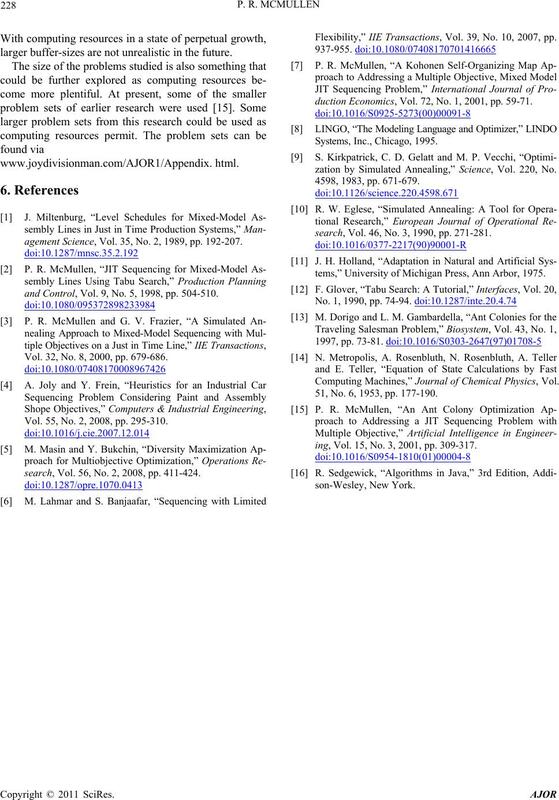 Computing Machines,” Journal of Chemical Physics, Vol. 51, No. 6, 1953, pp. 177-190.
ing, Vol. 15, No. 3, 2001, pp. 309-317.